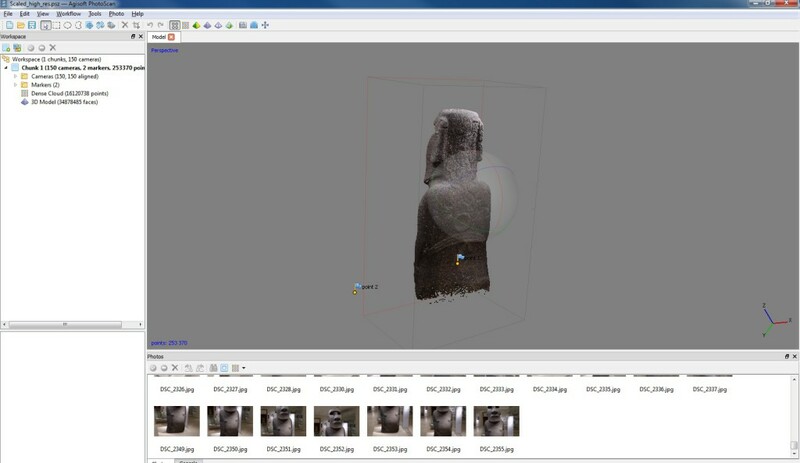 Here at Archaeovision we utilise photogrammetry in a lot of the work that we do. 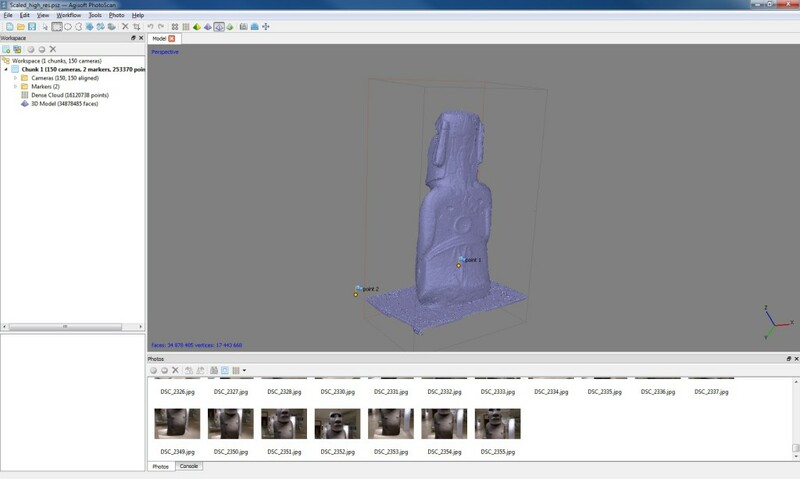 It is a cheaper method in many ways to traditional 3D recording techniques but it is often associated with slow processing times and at times the overall model can be poor. 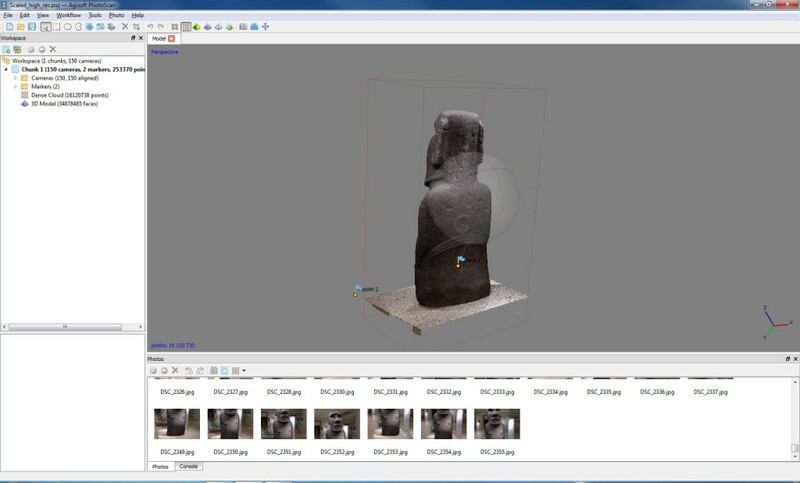 Agisoft have recently released an upgrade to their photoscan software, which is the main photogrammetry software that we use due to the level of control that it gives us within the production of our 3D models. We have found that other types of software rely too much on the production of a texture to make the final model realistic. Previously we have had to wait days and sometimes weeks to produce a model only to find out that it contains a series of errors. This is now a thing of the past! With the upgrade to the software, Agisoft have redeveloped the algorithms used in producing a point cloud from the imputed photographs and we are now able to produce a much high resolution model in a shorter time period. This for cultural heritage is of great importance. It means that production of the models can be much quicker, for academic units it allows for more research within a given time and for museums it allows for collections to be recorded and processed for displays and 3D printing in a much shorter time period. The software has undergone a change in terms of the way the it processes the model, you still have to input the images, draw masks to remove background data (which can take a very long time depending on the detail of the object recorded) and produce the necessary point cloud. The change occurs as this point, rather than give you the generic point cloud (previous version), which can be limited in the number of points, it instead offers the user to produce a dense point cloud from which a mesh can be be produced. This addition of a dense point cloud is something that has taken us by surprise! Yes photogrammetry has always been compared to laser scanning, and it has been said that the two are methods are comparable in resolution. We weren’t completely convinced by this, simply because laser scanning can be record at micron resolution, whereas photogrammetry is very much limited to the resolution of the camera, the lenses used and the size of the object being recorded. Using the older version of the software meant that the overall model may be missing points in certain areas as it wasn’t too sure about the point location. This is still evident in the production of the normal point cloud, but the density of points within the dense point cloud completely removes this and allows for an even distribution of the points across the whole model, meaning that photogrammetry, in our eyes, is now comparable to laser scanning. In order to express our delight with the new version of photoscan, we reran one our old models, the Hoa Hakananai’a statue from the British Museum, from the start. Below are a series of images that highlight how good the new software is. The model originally took over 500 hours to process using 500 images; the errors associated with it proved that too many photographs confuse the software and limit the end result of the model produced. Instead the model was rerun using 150 images and took around five days to produce a point cloud and subsequent model. The overall model was accurate in terms of the mesh produced and we were able to see everything needed to understand the story behind the petroglyphs, but importantly, the model was limited to 253 000 points. Having rerun the model in the newer version of the software, the dense point cloud was able to produce a point cloud of 17 million points from the same images. This is outstanding in terms of quality and it allowed the missing sections to be filled in (to our great joy). The overall mesh created had 34 million faces simply because it had more points from which the mesh could be based. The outstanding thing about this new model was that it took less than one day to produce and removed all of the errors that were previously within the model (the eyes had issues due to shadowing)! The results themselves prove that the upgraded software will have a huge impact in the work that we provide. Not only will we be able to produce higher resolution models for our clients but we can do this at a much faster rate, meaning that we can offer much more for our time. The photogrammetry models that we can produce are now very much comparable to our laser scanning models and could be seen as an alternative way to collect your data. Photogrammetry still has it downfalls, it still requires a huge amount of man hours to produce images from which the software can use (masking) and it still requires high spec computers to produce the models in this short time period. We at Archaeovision are greatly looking forward to the next few upgrades that Agisoft will produce, adding in new features to help meet the needs of the people that use their software. We are in contact with the company and as individuals we are discussing ways on how to produce an even better version of an already extraordinary piece of software. If anyone wants to utilise our expertise in producing models like the one below then please do get in touch with us! I use this software to create 3D models of carved caves. However sometimes the produced pointclouds have misplaced points that originate errors on the final model. I was wondering if manual adjustment can be a future input for the software instead of relying only on automatic alignment? I know other software that you can run on several images and “tell” the software which points to match within a set of photos. Then it will create a more accurate model as it will recognize these points..
Let me know if this feature will be available.. There already exists manual adjustments for individual photos within the software. Also on the professional version you can select manual points which aids the stitching process. I was wondering how much time it now took for Photoscan to do the 500 photos? Is it still weeks? We are looking at some options and were thinking maybe Photoscan might be worth a punt if it is significantly faster than (say) Visual SFM.